Our annual conference brings together thought leaders and experts on civil and human rights, housing, lending, insurance, education, transportation, health, environmental justice, and community development to examine achievements made under the Fair Housing Act. Online Registration is now closed. However, registrations will be accepted on site. 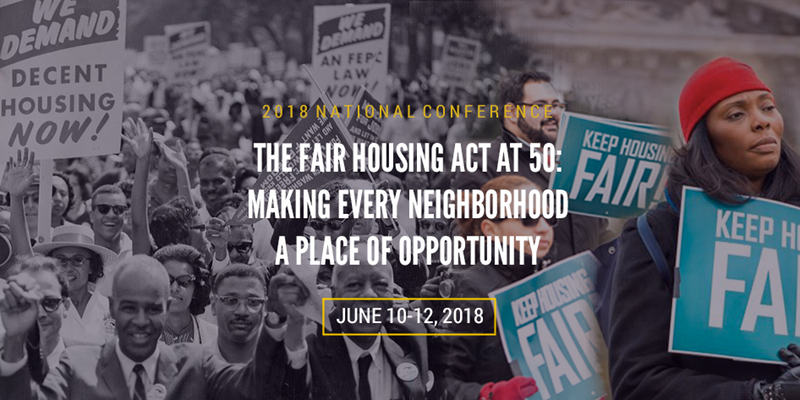 The National Fair Housing Alliance’s 2018 conference brings together thought leaders and experts on civil and human rights, housing, lending, insurance, education, transportation, health, environmental justice, and community development to examine achievements made under the Fair Housing Act; current barriers to fair housing and inclusion; and what is on the horizon in the coming years. Each of us has implicit biases, and our society includes structures that perpetuate racial inequities. In this training, we will learn how to recognize and address the biases within us that, individually and collectively, have a negative impact on our communities. We will also learn about the tools available to help us identify and overcome the structural racism that puts barriers between people of color and other members of protected classes and the opportunities to which they–like all of us–must have access in order to flourish. This annual favorite features a review of significant fair housing cases in the last year. We live in a society where our zip code determines too many of our outcomes in life, including our likelihood of developing chronic diseases, our chances of being incarcerated, our ability to send our children to good schools, our access to reliable transportation and job opportunities, and our ability to accumulate wealth. We also live in a society where the average neighborhood is highly segregated by race. With race, place, and opportunity so intertwined, it comes as no surprise that there are huge gaps in educational achievement, wealth, employment, and health along racial and ethnic lines. Changing this narrative calls for cross-sectional solutions starting with fair access to housing at the core. This plenary session brings together leaders from the fields of education, transportation, asset building, and health to discuss where we are and to offer ideas for how we work collaboratively to ensure every neighborhood provides access to opportunity. This year saw the publication of The Fight for Fair Housing: Causes, Consequences, and Future Implications of the 1968 Federal Fair Housing Act (Squires, ed.). This panel features four authors of the book, who will address the key issues of barriers to access to credit, the legacy and promise of disparate impact, the importance of the Fair Housing Act to persons in protected classes other than race, and the centrality of housing to social justice and opportunity. What is big data and how does it affect housing markets? We generate data almost everywhere we go and leave a constant digital trail. While there may be some business advantages in the collection, analysis, and use of this data, there are also potential negative implications for consumers and in particular for persons in protected classes. In this panel, we learn what big data is, how it is used in the industry, and the fair housing and civil rights concerns related to the use of this data in housing, lending, and insurance markets. Well before housing discrimination was outlawed nationally, several states and cities created and maintained fair housing laws that helped form the basis of support for the Fair Housing Act which we enjoy today. In the past several years, fair housing practitioners from across the nation have seen opportunities to strengthen fair housing protections in state and local laws. An even greater number of advocates have faced off against state and local legislatures aiming to undo existing protections or recent advancements in fair housing. Whether it has been a state legislature proposing to regulate the verification of reasonable accommodations requests or state-level preemption of local inclusionary zoning ordinances, fair housing advocates have played an increasingly active role in state and local legislation affecting housing choice. Please join a panel of fair housing advocates to learn about how the fair housing movement can respond to challenges to existing protections, advance fair housing priorities, and build support for greater fair housing rights at the state and local level. Panelists will discuss their experiences and the strategies they employed to fight off anti-fair housing legislation or to strengthen state fair housing protections and housing choice. 50 years after the passage of the Fair Housing Act, many Americans are still not aware of their fair housing rights under federal or local law, and fair housing is often thought of as a movement that only works to fight race-based discrimination. To create a broader base of support for fair housing, it is imperative that we improve our outreach efforts to engage a larger audience. This panel brings together experts working to educate and serve the needs of members of some of the other protected classes covered under the federal Fair Housing Act. Panelists will share insights on the issues facing victims of specific types of housing discrimination, including discrimination based on religion, national origin, disability, and sexual harassment in the housing context. Standing under the Fair Housing Act has been interpreted to be as broad as the U.S. Constitution permits; accordingly, courts have allowed housing discrimination enforcement by a wide range of private plaintiffs. Last year, the U.S. Supreme Court in Bank of America, et al. v. City of Miami strongly ratified a core principle of standing under the Act while leaving open for lower courts a central question of how proximate cause is defined in establishing harm under the law. This panel will focus on the past, present, and future of standing under the Fair Housing Act; lessons fair housing investigators may employ in developing cases with facts that preserve powerful standing jurisprudence; and the potential abuse of the law regarding purported “drive-by” practices, outside the movement. Concurrent Workshop – Separate and Unequal: How Will America Overcome Pervasive Discrimination and Segregation? The housing choices available to people of color and other members of protected classes have been limited for decades by public and private policies and practices that created segregated communities, starved for resources and vulnerable to exploitation and abuse. Addressing the harms caused by this pervasive discrimination and segregation was one of the goals of the Fair Housing Act, a goal that was largely ignored for most of the first 50 years of the Act’s existence. In the Obama administration, HUD took a series of long-overdue steps to begin to tackle segregation, including issuing an Affirmatively Furthering Fair Housing regulation in 2015. The current administration has put that rule on hold, raising questions about how our country will address this pressing issue that harms us all. This panel will explore the implications of HUD’s suspension of the AFFH rule, lessons learned from the nearly 50 jurisdictions that created Assessments of Fair Housing called for by the 2015 rule, and what path jurisdictions are charting moving forward. Fair housing is like many other topics; it can appear academic, dense, and difficult to grasp. The creative arts may be utilized in every field to reach more people and to more effectively and eloquently convey a message. Younger generations in particular require more visuals, artistry, and music to both capture and retain their attention. In this workshop, we will hear about various creative arts–including strategic storytelling, poetry slams, video, and more–that can be used to make our messaging more dynamic, persuasive, and even fun. We will also learn a few tips to improve our public speaking. Time will be allotted for audience members to share ways they have used the creative arts to teach people about the importance of fair housing and making every neighborhood a place of opportunity. The 50 years under the Fair Housing Act has featured creative and aggressive litigation resulting in expansive relief; yet, much work remains to be done. As the lines of segregation in our cities remain persistent, amid gentrification pressures, and as the nation’s demographics become more diverse, international, and senior, protections on the basis of race, color, national origin, and disability will need to shift in our developing communities. New ground is being covered to challenge discrimination on the basis of LGBTQ status and source of income, and there is new opportunity to analyze market policies under the Supreme Court’s ratification of disparate impact. This panel will focus on the existing and emerging housing policies and practices that may be challenged in coming years and how this may inform building effective systemic investigations. The panel will involve a mock-case exercise and strategy discussion. Keynote Address: Vien Truong Chief Executive Officer, The Dream Corps. The housing landscape has undergone critical changes over the past 50 years, and the next 50 years will bring developments that will dramatically alter how consumers access housing opportunity and how industry provides housing and financial services. Technological advancements, internet-based housing service providers, shifting demographics, climate change, and legislative developments will gravely impact fair housing choice. Fair housing practitioners and housing providers must adapt with the changing times. We also must continue to improve our efforts to address systemic and institutional barriers to fair housing and the creation of inclusive communities, as well as develop strategies to ensure that every neighborhood is a place of opportunity. In this final session, we identify barriers to opportunity and explore how we meet the challenges that must be addressed in the coming years. Take advantage of your time in Washington, DC, and visit your Senators and Representatives on Capitol Hill! Take this opportunity to represent the important work you are doing in a face-to-face meeting with House and Senate staff. Join a Capitol Hill staffer, NFHA board, and NFHA staff for a policy briefing prior to Hill meetings. We’ll show you how it’s done and team you up with NFHA board members, who visit the Hill two to three times a year. Then we’ll all head to the Hill together for the afternoon. Please see separate registration form. The cut-off date to receive the negotiated rate is May 4, 2018. Please identify special service or meal requirements on the registration form and confirm with the NFHA office at (202) 898-1661. The NATIONAL FAIR HOUSING ALLIANCE has made every effort to secure the best possible group nightly room rate for you at this event. That rate results from a negotiated overall package of event needs such as sleeping rooms, meeting room space and other requirements. NFHA will incur costs if it falls short of its minimum room block guarantee. Please help NFHA keep the costs of this event as low as possible by booking your housing needs at the designated hotel and in the NFHA room block. Reserving outside the contracted room block may jeopardize NFHA’s ability to meet its contracted obligations and to keep registration fees at a minimum. NFHA appreciates your support and understanding of this important issue. Thank you. Cancellations must be received by May 30, 2018, to be eligible for a refund. The National Fair Housing Alliance is committed to providing the greatest accessibility within its means in all its projects, programs, meetings, and conferences.